The 3540i is a programmable step motor driver suitable for a wide range of motion control applications. It includes a sophisticated controller integrated with a 140 watt microstepping amplifier. The 3540i includes Applied Motion's easy to use Si Programmer Windows software for the rapid development of stand-alone motion control programs. The 3540i can also be commanded in real time from a host PC or PLC, using the Si Command Language (SCL). SCL allows for control via serial commands sent from a host device such as a PC or PLC. This permits the user to perform a variety of motion, I/O, and system status tasks in real time via a host serial device. For multi-axis applications, up to 4 Applied Motion Si drives (stepper or Servo) can be networked using a single SiNet Hub. The 3540i includes 8 optically isolated programmable inputs for triggering, branching, position sensing and end of travel detection. 3 optically isolated programmable outputs can send signals to other electronic devices and activate relays. 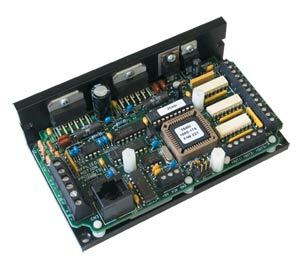 A daughterboard is available which provides an encoder input as well as an RS485 interface. 참고: Programming cable included. Software is a free download; click on "Software" icon below the picture. To see torque-speed curves for recommended motors, click on "Specs" above.